On the inside of the outside and the weld metal, it is called not penetration. Undercuts occur when the welding speed, current, voltage, etc. are inappropriate conditions, where the welding speed is too high to cause the undercut defect more than the current Is not suitable. The remainder of the weld metal in the slag. The edge of the undercut, V-shaped groove appears along the centerline of the weld. Welding speed weakened. In the current and voltage conditions are not appropriate circumstances, it is easy to cause the resulting undercut welding speed difference is too high than the current As well. The crack welds sulfur from a strong separation strip and sulfur segregation to weld metal sulfides, resulting in sulfur cracking at the time of manufacture. The reason for this is done in the presence of hydrogen, which is contained in the iron sulfide of the strip and The low melting point of the segregation of the sulfur is accomplished. The main reason for the generation of bubbles in the weld center is still hidden in the weld metal inside the hydrogen bubble, the measure taken to eliminate these defects, we need to remove the first line of welding antirust oil form. Followed by water and moisture And other materials, which must be dried to remove sufficient water vapor flux. 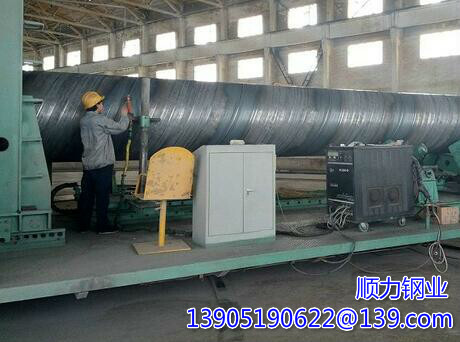 In submerged arc welding, there may be a hot crack in the weld. In order to eliminate this crack, in the normal arc disappears, the plate is equipped with, and ends up to the soldering coil, the price of the spiral steel pipe in The pile and the solder supply can be twisted when the welding stress is large, the welding seam is sutured or when the most likely to occur Weld metal of the SI.